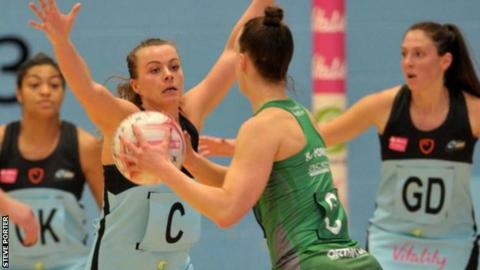 Celtic Dragons held on to win 48-46 at Surrey Storm and record three wins in a single season for the first time since 2014. Also in round eight, Team Bath beat Manchester Thunder 60-56 and Loughborough Lightning edged London Pulse 56-51. League leaders and defending champions Wasps remain unbeaten after a 61-34 win over struggling Strathclyde Sirens. Saracens Mavericks are second after a 64-46 win at Severn Stars on Monday. A number of matches from round eight could have made the cut but the sheer drama and rollercoaster nature of Dragons' victory over Storm stands out. The visitors held an eight-goal lead at one point but Storm surged back into contention in the dying minutes before Dragons held their nerve to take the victory. Dragons captain Nia Jones called the match a "dog fight" while head coach Tania Hoffman was pleased her side "dug in". In-form Mavericks are the closest pursuers to leaders Wasps following a convincing away victory over Stars on Monday evening. Lightning moved level on points with third-placed Thunder with a gutsy home win over Pulse, who remain bottom of the Superleague table. Bath secured their first win of the season over a top-four side, seeing off a late rally from Thunder, who have now lost two in three and face table-toppers Wasps on Wednesday. Nicknames are a big part of sport - who could forget David Beckham aka Golden Balls or LeBron 'King' James? And netball players are no different. England and Team Bath centre Serena Guthrie goes by the moniker SerenaBob on her social media channels because of her signature afro-bob hairstyle. But why is her brother Kurtis, a striker for League Two football club Stevenage, known as 'The Chief'? "It comes from him having the sticker of an Indian chief inside his first car," Serena said. "He absolutely loved it, he was obsessed with it and just named himself that and it became his lucky sticker. "It also stems from the values of a chief - they are wise, the head of and respected by communities and my brother identifies with that and wants to encompass that, he wants to be the guy people come to for advice." The 25-year-old former Colchester United forward loves the name so much, his pet dog is called - you guessed it - Chief.